My old Piper PA-28-140B Cherokee was a great airplane, an excellent starting solution for getting flying experience. She was equipped for long tours, the only problem was that the cruise speed was between 105-110 knots and with a 20 knots of a head wind the cruise speed dropped down to 90 knots. At the time when I was buying my Piper I was also checking a possibility to buy one Mooney. It was back in 2007 when the aircraft prices were not so low as now days due to financial crisis. Unfortunately the lowest prices for Mooneys at that time were between 60.000 and 70.000 EUR and I couldn't afford it. Especially I was looking for one aircraft in Germany M20F with turbo-normalizer with the price of 66.000 EUR. Then I bought my Cherokee D-EHFK. After about 2 years I started to think about the possibility to start training for instrument rating (IR) and immediately it was clear that IR rating means nothing if I will not practice it in my flying. Unfortunately Cherokee was just VFR certified and upgrade to IFR would cost me quite a lot of money. The cheapest solution would be to find an IFR certified airplane which would be also faster. So I started again with regular checking of PlaneCheck website. I was checking Cessnas, Pipers and Mooneys. The German Mooney was still unsold after two years and now the price was only 45.000 EUR. I started a discussion with the owner and got the documents from the latest annual check. Then in January 2010 I found a very nice Mooney M20F in Austria at Wiener Neustadt. The airplane was in great condition, IFR certified, German register, but not capable for commercial usage as the engine was over 12 years. The price was 58.000 EUR and if the owner would reduce it to 50.000 EUR I would probably buy it. I decided to inspect Mooney in Germany with the turbo-normalizer. Due to some projects at that time it was hard to find the right time for inspection as it was still winter weather. So finally I drove to the north of Germany. There was a fresh snow on the runway and the owner didn't want to make a test flight what was a big disappointment for me. During the inspection I found corrosion on several places and it was obvious that the airplane was somehow neglected during last years and was maintained only as much it was necessary to keep it airworthy. They were trying to sell the airplane already for 3 years but with no luck. When I came they reduced the price to 35.000 EUR for quick sale. The airplane was registered just for VFR and would need immediate investment of about 12.000 EUR to make it ready for IFR certification. They told me that there is also another potential buyer interested for the airplane. Immediately after return to home I had to go to Macedonia for one week and then I got the email from the owner that the second buyer paid the deposit and they sold the aircraft to him. I felt somehow deceived but at the same time I was happy as the required investment was not so small. Then one day I found Mooney M20E, production year 1966, located in United Kingdom, call sign G-ATOU (see the album). The price was 31.900 EUR, engine overhauled in 2001 with 1200 hours to go, propeller overhauled before 3 years, so still 3 years to go. Avionics was IFR - Garmin GNS430, Garmin GTX330 S-mode transponder, Narco DME890, Narco 810 TSO as second COM, Narco 825 TSO as second NAV, Narco MBT-12 marker receiver and Honywell ADF-T-12C ADF receiver. Finally full IFR avionics! I have immediately contacted the seller and after some negotiation he guaranteed me number one buyer position and we agreed that I come next weekend for inspection. 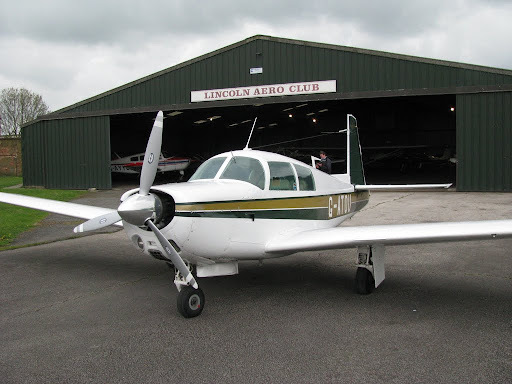 So I used my Miles&More award miles for a free ticket to Manchester and also reserved a rental car with GPS as I had to go to Sturgate airfield (EGCS) where Mooney was located. Driving on the left side of the road for the first time in my life was a night mare. I was very happy with the results of the inspection and we signed the agreement and I had to pay a deposit within 3 working days. After return to my home I performed some more checks with the mechanics and then decided to pay the deposit, and after some days the whole price.